Clothing fashions of WWII have always been a source of fascination for me, not because I’m a fashion goddess and just have to know every detail of vintage fashions. Instead, I’m intrigued by the way the circumstances dictate fashion. Just as rationing affected recipes and eating habits during the war, rationing also influenced fashion to a great degree. In the 40s, when Americans were faced with fabric shortages, hemlines became shorter, necklines became lower, and outfits became slimmer and more streamlined. In addition to everyday wear, bathing attire also changed. For the first time in the United States, the two-piece swimsuit emerged presumably due, at least in part, to fabric rationing. It should be noted, however, that modesty was still very much in still, so ladies’ two-piece bathing suits still covered a far amount of skin. One thing that is quite noticeable about two-piece swimwear at the time is that few, if any, revealed a lady’s belly button! What tasteful way to introduce the latest in swim fashion while maintaining a proper, lady-like appearance! 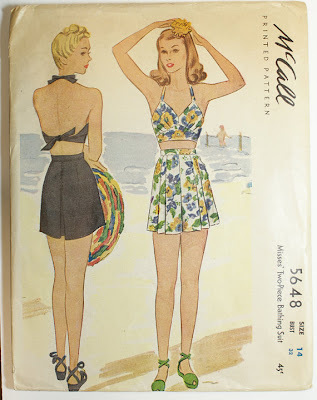 So next time you head to the beach, pool, or other summer watering hole, think about the history of fashion and the lasting impact of wartime rationing!